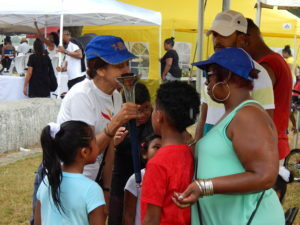 I loved being part of a Peace Run display/torch sharing with the Cape Verdean Independence Day Festival. Scenes from the event just published to the Peace Run official website. One of our members of the Rhode Island Sri Chinmoy Centre was born in Cabo Verde (formerly called Cape Verde) and I was so inspired to learn more about Cape Verdean culture and to hear the President of Cabo Verde speak in Rhode Island with many state and federal officials present for the event.